2009 has not been a good year for press freedom in Morocco, and over the past few months, actions against journalists seem to be escalating. Although journalists are aware of the country's press law – which forbids criticism of the royal family, Islam, and the Western Sahara – many choose to push past it, hoping for leniency. They rarely find it. Does the King Have the Flu? In August, the royal palace announced that King Mohammed VI was ill with a “viral, benign disease.” Amid an epidemic of H1N1 flu, several journalists questioned the palace's official announcement, suggesting that the monarch was ill with the flu virus or that he had “abused immunodepressants to treat asthma.” In mid-September, authorities began calling in and arresting journalists who had written on the subject. Editor Ali Anouzla and journalist Bochra Daou of Al Jarida Al Oula are expected to stand trial October 21, while on October 15, the editors and journalists associated with Al-Michaal were handed a grave sentence: Editor Driss Chahtan was sentenced to a year in prison, while journalists Mostafa Hiran and Rashid Mahameed were given three months in prison ‎and‎ a 5,000 dirham (US$655) fine each for “intentionally publishing false information” in a number of articles about King Mohamed VI’s health. A number of organizations, including the Committee to Protect Journalists (CPJ) and Solidarité Maroc, have condemned the decisions, and bloggers have reached out in solidarity with the journalists. Shortly after the wedding of Prince Moulay Ismail, Moroccan daily Akhbar Al Youm published a cartoon featuring the prince amongst several 6-pointed stars of David. The Moroccan Interior Ministry condemned the cartoon, calling it “blatant disrespect to a member of the royal family” and stating that the use of the Jewish symbol “raises many questions on the insinuations of the people behind it and suggests flagrant anti-Semitic penchants.” On September 29, police prevented staffers of the paper from entering their offices, effectively hampering publication. According to CPJ, the Interior Ministry has no right to shutter a paper, only to prevent the publication of an issue criticizing the royal family. Still, editor Taoufik Bouachrine and cartoonist Kalid Kadar face criminal defamation charges on October 23. The Moroccan government has grown increasingly sensitive to the country’s independent media as they broached subjects considered verboten. Its judicial and political cannonade of independent journalists and artists, and the newspapers and magazines they work for belies its averment it advocates and protects freedom of speech and freedom of the press. Some observers pointed out that the government stands as the backstage instigator of the ad hominem bickering plaguing the independent media these days. 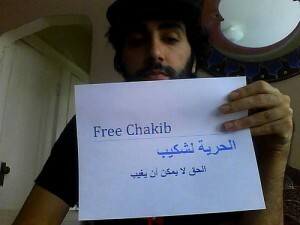 Human rights activist Chakib Khayari, a leader in the fight against drug trafficking in Morocco, was arrested in February 2009 for “gravely offending” Moroccan state institutions by criticizing lax drug interdiction policies. Khayari was then sentenced (on June 24, 2009) to three years in prison. Human Rights Watch condemned the actions of the Moroccan government. Khayari's sentence has sparked a campaign amongst the Moroccan digital activist community, with a Flickr photo campaign, Facebook group, and Twitter account being used to spread awareness. On October 15, Khayari appealed the case. His trial resumes October 22. Good article but the last note about Le Journal Hebdo is basically old news as you can see in the AFP article that you link to. The original sentence is from 2006 and the Supreme Court merely upheld the verdict, which was expected. The Court did however lower the fine from 270,000 euro to 250,000 euro. The ruling in itself follows the logic of the Moroccan legal system. What is really shameful is the actions of the ESISC “think tank”. Anyone in their right mind would question the impartiality of their “report” on Polisario from 2005 since it tampers with and withholds basic facts about the conflict over Western Sahara, and this is exactly what Le Journal Hebdo did. The journal questioned the report and its impartiality. This is not a crime in most parts of the world. In Morocco however ESISC could sue for defamation. Due to ESISC’s weird view on freedom of press, one of Morocco’s few independent journal now risks ruin and closure. Shame on ESISC and their president Claude Moniquet! Thank you Laroussi – I know the last bit is “old news” but the fine is new and important to share despite the age of the story itself. And the really puzzling (and interesting) thing about it is the battles they have been choosing. The flu??? A survey about the king with – what? – like a 90% approval rating?? The current wave of censorship is notable, terrifying and laughable (were the consequences not so grave for the journalists), particularly because the cases they choose for these retrograde, draconian responses are so arbitrary and minor. It illustrates vividly the larger problem – the absolute failure of the judicial system to dispense anything remotely resembling justice.